1984. ‘Oya 2’ Koi farm – Koguriyama village. I have named this as ‘Oya 2’ to avoid confusion with the other Oya mentioned earlier. Koguriyama village covers both sides of the road which passes through it if one is travelling from Iwamagi towards Uragara. This ‘Oya’ is on the left side of this main road whilst Hiroi and Shinoda, covered before, are on the right side of this road. One has to climb high up from the main road to get to this farm which is just about hidden up there on an acute bend in the road. I stumbled upon this outlet by pure mistake after taking the left turn for the very first time. It is owned by Tetsutaro Kataoka who produces Go-Sanke and the rarer Yamatonishiki varieties. Both of his sons today work part-time at the nearby Izumiya facility. 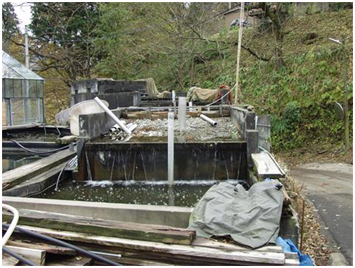 His entire farm is run through one enormous ‘gravity-fed’ filter system which is sited right next to the narrow road. If you’re going to get a filter, why not get a big one? Tetsutaro is well known throughout the surrounding area, I have only bought a few small rarer varieties here to date. My first impressions – ‘a secret hideaway’.